HTC stock bottomed out at NT$56.80 ($1.80) per share on Monday— eventually closing at NT$57.50 —while the company holds NT$57 per share in cash. In effect, this means that investors do not believe HTC has any intrinsic value as a going concern. Despite garnering generally favorable reviews for its handsets, such as its current flagship One M9, HTC has found itself unable to fend off competition from Apple and Samsung at the high end and cheap Chinese brands at the low end. A recent expansion of its product line— with the release of the handheld Re camera— and an executive shakeup that saw cofounder Cher Wang take the reins as CEO have not been enough to convince investors that the company can be salvaged. 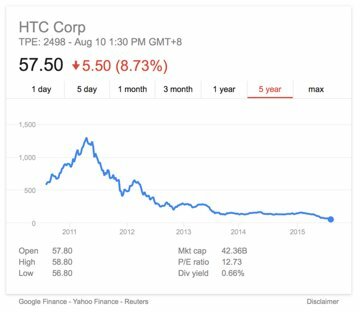 Some have also suggested that its weakened financial position may make HTC a prime acquisition target, though the company's largest asset— its brand— has also lost its luster. Earlier this year, HTC's smartphone market share was estimated to have fallen below 2 percent globally.